Italy, 19 Feb, 2017: Two documentaries on the plight of refugees off the Italian coast and the Greek coast, respectively, have received Oscar nominations this year. Fire at Sea by Gianfranco Rossi has been selected in the Documentary category and 4.1 Miles by Daphne Matziaraki has been nominated in the Short Documentary category. Rossi’s stunning camera frames the island of Lampedusa as one of the characters in his film. Remote and rather desolate, its rocky shores are forbidding to any who would attempt to swim ashore. But over the past 20 years, this tiny Italian island, 120 kilometers off the Sicilian coast and 70 kilometers off the coast of Tunisia, has become a gateway to Europe for close to half a million refugees from Northern Africa and the Middle East. Twenty-seven thousand people have lost their lives there. The Italian Coast Guard is constantly searching the open sea for makeshift boats overflowing with hundreds of souls, most of them women and children. Rossi’s documentary captures the drama. In one instance, one member of the Coast Guard receives a desperate call from a woman who is pleading for help. Time is of the essence; if the Coast Guard does not get to them immediately, they will drown. Rossi’s documentary shows the migrant drama unfolding next to the quiet lives of unassuming islanders. In an interview with VOA, Rossi said that these two communities, the islanders and the migrants, never meet. He says he wanted to show Lampedusa not only as an actual place of migration but also as a metaphor of what’s happening in the world. “Two forces that barely touch each other, and they never meet,” he says. 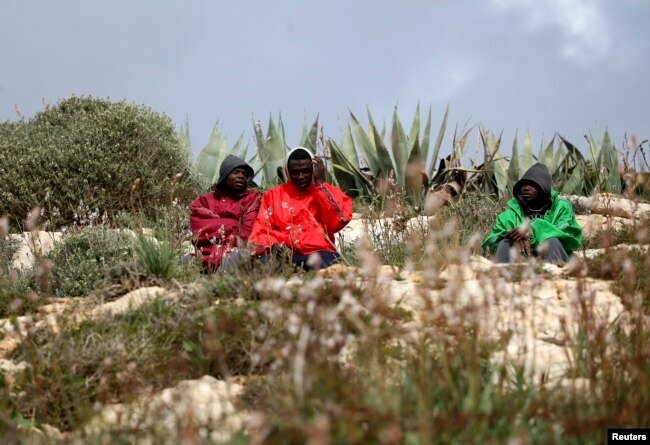 Migrants sit outside the immigration center on the southern Italian island of Lampedusa Feb. 19, 2015. He centers his film on Samuele, a Sicilian boy living on the island. A professed hunter among seafaring people, Samuele is hunting birds, pointing his imaginary automatic rifle to the skies and shooting unseen enemies, training his expert slingshot on hapless cacti. Rossi likens him to a humanity that has not yet reached maturity. Samuele is exuberant and destructive but also tenacious and introspective when he is called to train his lazy eye by covering the good one. On the other end of the spectrum is a doctor, Bartolo. As the only physician on the island, Bartolo is the person in which the two worlds meet. He examines every single refugee coming to Lampedusa and confirms the dead. Bartolo is the film’s voice of reason and compassion. He decries the indifference of the world toward such humanitarian crises. “All this leaves you so angry. It leaves you with emptiness in your gut, a hole,” he says. The refugee crisis is also at the center of Matziaraki’s 4.1 Miles. The film chronicles around-the-clock rescue missions off the Greek island of Lesbos. Kyriakos, a member of the Greek Coast Guard and the main character in the story, says that he and his team are called to rescue 200 people per hour. According to the film, in 2015 and 2016, 600,000 migrants crossed the 6.1 kilometers — 4.1 miles — of water between Turkey and Lesbos. Matziaraki’s documentary is visceral. Often shooting with cameras attached to rescuers’ heads so that we experience the moment-to-moment rescue, she conveys how every second of pulling someone out of the water makes a difference between life and death. Kyriakos is a modern-day hero, quiet, collected, but also dismayed by what he has witnessed. The camera often closes in on his tired face, describing what we cannot see. 4.1 Miles is also more openly critical than Fire at Sea of the world community that, as the inhabitants of Lesbos say, has abandoned both islanders and refugees. Rossi hopes Fire at Sea helps bring awareness about the refugees’ ordeal.